Are you looking for a way to consume less energy in your home or office? Sealed Glass Window Units are ideal for cutting costs, while also being better for the environment over single pane windows. This product consists of two panes of tempered glass separated by a spacer. The space between the two panes of glass is filled with air. These are most often used in residential window applications. These are custom manufactured dual pane window units, meant to be replacements for existing windows in your home. You can select the overall sealed window unit thickness and tint of the glass. These can be purchased with or without the white grid between the panes. 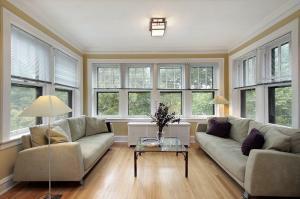 There are several benefits associated with dual pane windows. The most well-known is energy savings, as they are the most common type of energy residential insulated windows on the market today. Originally intended to protect homes from extreme weather conditions, other benefits have been convincing people to install them with increasing frequency. Dual pane windows keep the heat out during the hot months and cold out during the cold months, cutting down energy use. Additionally dual pane windows help with noise reduction and can update the appearance of a house while also increasing resale value. Trusting One Day Glass to build your units ensures that you receive your windows quickly, since we build them in-house. We understand that a broken window needs to be fixed quickly. Using us ensures that you will never miss closing a deal as a result of a broken unit. Our mission is to help you regardless of the size of your order. If you do have a large order, we also have wholesale prices to better help with your bottom line, all the while providing the units in the same time efficient manner we promise to all our clients.